Bear with me everyone because this is my first long-form post since the big switch. If you're a Real Housewives of Everywhere fan like I am, or you just happen to flip to Bravo every time you turn on the television it's likely that you've seen Real Housewives of Atlanta's Kenya Moore refer to herself as "gone with the wind fabulous" or one of her cast mates making fun of her and twirling in circles. Moore also recently released a music video where she again, twirls around and around proclaiming that she's "gone with the wind fabulous." 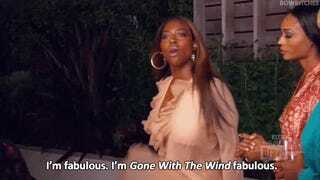 Beyonce gave the saying some staying power by referring to her superbowl performance as "gone with the wind fabulous." There's no doubt that both Moore and Beyonce are fabulous women in their own right or that there are MANY people who are fans of Gone With The Wind and its film adaptation. But, is being "gone with the wind fabulous," if we're being literal here, really being fabulous at all for a black woman? And if it is, what does it mean to over look all of the racism and antebellum nostalgia of the book and film? I mentioned that something was "gone with the wind fabulous" to my mom the other day as a joke and she gave me a blank stare for a second before asking if I was being serious. I told her it was a quote from one of the Real Housewives of Atlanta and she replied saying that she didn't get it and I realized that in actuality, life didn't seem at all fabulous for the Mammy caricature portrayed by Hattie McDaniels in the film. Though I know few roles were available for black women at the time (that's a whole other conversation) the Mammy character as the only lead black role in the film helped reinforced negative stereotypes for every person who watched the film. While viewers today can (hopefully) recognize that slavery was horrific and that not all black women fulfill Mammy stereotypes, they still watch as a fabulous, beautiful and enviable Scarlet O'Hara is chastised by an androgonous and defeminized, inarticulate Mammy. In short, black people don't get to be fabulous in the movie at all. A lot of fans of the film don't even realized that although Hattie McDaniels won an oscar for best supporting actress for the role of Mammy, she was forced to sit in a segregated section at the awards ceremony because she was black. On one had, I'm encouraged that Moore (and Beyonce) seem to be alligning themselves with the positive and "fabulous" aspects of the film, regardless of what race the attribute is delegated to. The message of being fabulous when taken at face value, is a positive one. But I'm still wondering, what does it mean to introduce "gone with the wind fabulous" into pop culture as a sign of black female power, strength, and fabulosity when the film contradicts that message in so many ways? Now that I actually thought about what I was saying, I can't help but cringe when the incredibly racist and awful aspects of Gone With the Wind are glossed over the way so much sexism and racism towards black women and all women of color is glossed over everyday. Is it possible for Moore and Beyonce to claim the fabulosity while undermining the racist Mammy stereotype? Is being "Gone With the Wind Fabulous" truly not that fabulous at all? Furthermore, how do we start (and finish) conversations about the truly racist and awful parts of beloved American culture that white people claim, and black people sometimes want to claim too? (Accidental Racist I'm side-eyeing you).